An ultimate solution for multi touch interactive screens - 32" - 82"
OPTIR Touch - HCMT Model supports multi touch 16, 32 and 40 simultaneous touches for Windows 7 or 8 OS. 1. Maximum clarity - no added overlay except protection glass. 2. Zero force touch - can be activated by finger, gloved hand or stylus. 3. High durability - 100% solid state electronics, no moving parts. 4. Framed segments kit can significantly reduce the shipping cost. 5. Flexible purchasing options: framed segments (unassembled frames) or complete assembly (with or without backing glass). 6. We custom make it up to 200". No tooling charge. No minimum order. 7. 2-year warranty on most models. 8. Free life-time driver update and tech support. 1. For 27" & smaller sizes, it can be mounted by Velcro or double sided tape. A. If the OPTIR Touch is to be mounted in front of a completely flat surface, such as whiteboard, projection screen, video wall, or a display with very small or no recess from bezel to the display surface, the touch screen frame (without glass) may be mounted by double sided tape (permanent), or magnetic tape (temporary), or mechanical brackets. B. If the OPTIR Touch is to be mounted in front of a standard flat panel display, the glass panel and custom mounting will be needed. Contact us for more information. Touch Sensor Description: Embedded IR sensors form invisible light grid in front of the display. Operating Systems: Windows XP, Vista, 7, 8, Mac & Linux. Number of Touch: 16-40 for Win 7 or 8. 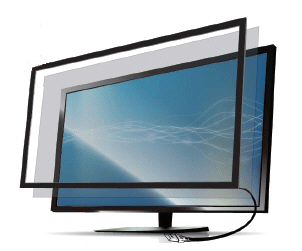 Standard Sizes: 32" - 82"
Mounting Method: By Velcro or double sided tape or custom mount. Activated by: Finger, gloved hand, stylus. Use under Sunlight: Yes. Adjust the angle to reduce the glare. Water Resistance: No unless specially sealed - extra charge. For Integration into standard display: May be suitable. Please check the dimensions.